The [Ryzen & GTX1050 Ti edition] Skytech Archangel gaming computer is as beautiful as it is ambitious. Featuring a Ryzen 3 1200 processor that beats the Intel Core i3-7350K fair and square, and a GTX 1050 Ti 4Gb graphics card that devours modern games at Full-HD resolution (medium to high settings), you’ll be hard pressed to find a better rig for less than $700. If you’re out in search of a cost-effective yet powerful gaming rig that will handle your video editing, CAD work, and gaming reliably, then you may want to pay close attention to this unit. While SkyTech is not exactly a byword in the gaming industry, it is an upcoming brand that has lately been sending ripples all around the gaming pool. 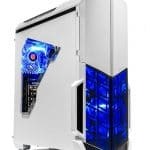 They made their entrance onto the gaming scene back in 2016 having noted that many gamers want to build their own rigs but lacked the skill to go about it. And that those who had the skill could not buy in large enough quantities to benefit from economies of scale. The [Ryzen & GTX 1050 Ti edition] Skytech Archangel gaming computer comes with an identical chassis to its predecessors. Housed in a docile yet charactered exterior, it subtly radiates a peaceful come aggressive gaming facade. Most gaming rigs seldom deviate from the red and black theme that characterizes gaming. Its a breath of fresh air to see a rig that breaks away this dark theme (not that we have any problem with it) into a brighter-less aggressive look. 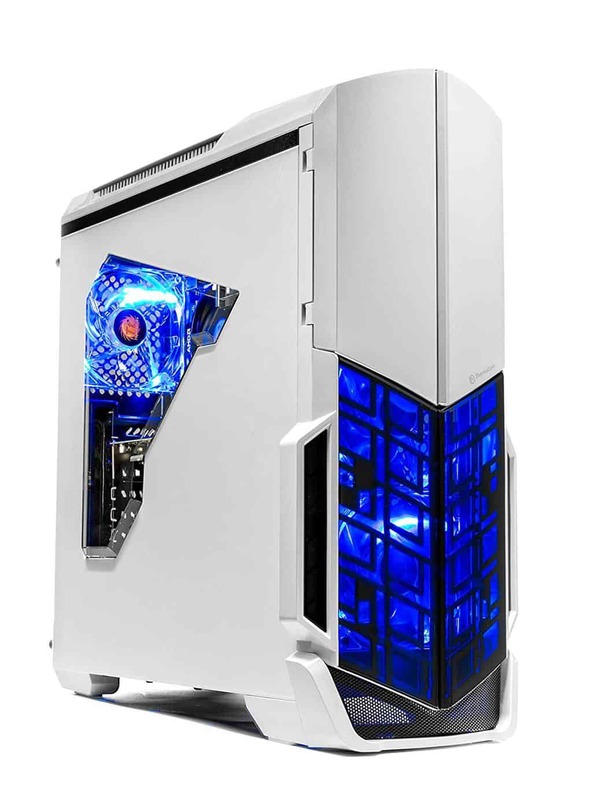 The SkyTech ArchAngel GTX 1050 Ti is housed in a sleek white metallic case with an extruded v-shaped face whose lower half is backlit with bright blue LED lighting. The overall design looks clean and simple but maintains the general eye-catching gamer aesthetic. The LED lighting makes it glow beautifully in the dark. The SkyTech Shadow GTX 1050 Ti gaming rig, one of the Archangel’s sibling features a black chassis and an FX-4300 graphics processor and a similar GTX 1050 Ti graphics card. The former retails at a slightly higher price at Amazon compared to the latter. As with many modern gaming rigs, we also get a transparent side window on the SkyTech ArchAngel GTX 1050 Ti which gives us a glimpse at the interior. SkyTech builds every unit by hand so cable management on this one is so clinically done it’s almost impossible to see stray wires within its bowels. Airflow is truly maximized on this build. That’s all because the cables are carefully routed to the rear leaving acres of free space at the front. There’s only one exhaust fan at the back so having free airflow is key for this SkyTech gaming rig. Gaining access to the interior involves removing a few screws. Inside you will find space for an extra RAM module and PCIe slots for future card upgrades. While 8 GB of RAM is sufficient for most applications, you also use the extra slot to boost performance (accommodates up to 32 GB). Keep in mind that the [Ryzen & GTX 1050 Ti Edition] SkyTech ArchAngel comes with a 500 Watt PSU which may some good amount of upgrade, but may eventually be a limitation. When that happens, our advice is to swap it out for a higher capacity 600w or higher PSU. It also comes with a clean install of Windows 10 Pro (64 bit) as advertised. Further, a keyboard and mouse are also supplied, and we must say – they are of good quality. Of course, you can get better peripherals if you need them, but in our estimation, they are good enough to get the job done. Most desktops come with an ample supply of ports. However, gaming desktops are not just ordinary. Often times they need to handle multiple monitor set-ups as well as VR gaming and thus need to be a notch higher than mediocre. The [Ryzen & GTX 1050 Ti Edition] SkyTech ArchAngel beats ordinary. It sports a plethora of ports sufficient to meet nearly every need a user may have. Additionally, there is a total of 10 USB ports [Six USB 3.0 ports and four USB 2.0 ports], four at the front and six at the back. It also comes with two HDMI ports (HDMI 2.0), one from the motherboard and one from the graphics card. Also present is a Dual-link DVI port and a DisplayPort (DP 1.4) which can support up to 5K displays (5120 x 2880) at a 60Hz refresh rate. With four external display ports, you can plug up to four monitors directly from the PC without needing a hub. Awesome! An Ethernet port is also present for wired Internet connections, that in addition to a WiFi adapter that is supplied separately just in case you need to work via a wireless network. Online gaming requires a stable and high bandwidth Internet connection – which is why a wired connection is preferred over WiFi. An HDMI cable is also supplied. Most gaming rigs, heck, most PCs that we have reviewed in the recent past have been powered by an Intel processor. Truth be told, Intel has held a larger market share than AMD for the last ten year. However, that does not mean that AMD processors aren’t good enough for the job. The SkyTech ArchAngel gaming rig enters the scene with a Ryzen 3 1200 processor, married with a GTX 1050 Ti GPU and 8GB RAM. Here’s where we explore the power behind the [Ryzen & GTX 1050 Ti edition] Skytech Archangel gaming computer: Its processor. Take a deep breath and dive right in. You probably are wondering how the Ryzen is stacking up with Intel processors. Well, performance-wise, the Ryzen 3 1200 beats the Intel Core i3-7350K and the Intel Core i5-2320 processor but falls slightly behind the Intel Core i7-3770. For this reason, we place the Ryzen 3 somewhere between a Core i5 and Core i7 processor. However, there are lots of factors that come to play here, which we don’t feel it necessary to go into. The Ryzen 3 1200 processor has a base clock speed of 3.1GHz, peaking at 3.4Ghz on demand thanks to the Precision Boost feature that it comes with (Intel refers to it as Turbo-Boost). It is an entry-level CPU with four cores and supports Simultaneous Multi-threading, a feature that allows the processor to intelligently schedule workloads thus saving time. For comparison purposes, we’ll stack let’s stack up against the Ryzen 3 1200 against its costlier and almost similarly speced competitor, the Intel Core i3-7350K processor. The Intel Core i3-7350K processor is a dual-core processor with a clock speed of 4.2Ghz but does not support Simultaneous Multi-threading (Intel refers to it as Hyperthreading). The Ryzen trumps the Intel Core i3-7350K at games on higher resolutions and quality levels. That’s thanks to the four-core processor design that offers better processing power than a dual-core design. When it comes to less demanding games such as Ashes of the Singularity, the Intel chip performs better since it offers better processing power per core than the Ryzen which excels in multi-core workloads such as are found in tougher titles. Overall, the Ryzen processor is the better option when it comes to gaming. The Ryzen 3 processor has an unlocked multiplier meaning that it is possible to overclock it using traditional methods. The sad part, however, is that while the processor can support an overclock, the ASRock A320M AM4 mATX motherboard cannot. Bummer! When it comes to RAM, the [Ryzen & GTX 1050 Ti Edition] SkyTech ArchAngel gaming computer does not disappoint either. Paired up with the Ryzen 3 processor is an NVidia GTX 1050 Ti 4Gb graphics card with 4 Gigabytes of Video memory, and add to that 8GB of RAM and 1TB of hard disk drive storage. For work and gaming purposes, and staying within the capabilities of the processor and graphics card, 8GB of RAM is likely enough for all you intend to use your machine for. Be it video streaming or working on multiple Excel documents at a go, or even browsing, 8GB is just fine. However, just in-case your unique browsing habits demand that you have numerous browser tabs open while you game, then it’ll be a good idea to go for an upgrade. Good thing there is an extra slot to take care of that. The 1TB 7200 rpm hard disk drive (HDD) on the other hand offers bulk amounts of storage and the highest speeds in the hard drive space. However, a hard drive would seldom be the go-to choice if speed is your principle concern. But considering the price at which the SkyTech ArchAngel GTX 1050 Ti gaming computer comes at, it would be unfair to complain about the lack of a solid state drive (SSD). Now that there is an extra PCI-Express slot, once you get this machine home and have had the time to enjoy it as it is, we would recommend you get an SSD so as to harness its full potential. Not that it cannot do without an SSD, but it’ll twice as well with an SSD than with a HDD alone. You might get a PCI-Express SSD, or an M.2 SSD along with an adapter to fit into the PCI-Express slot. The advantages to an SSD you ask? Well, you will get faster boot times, faster program /game load time and overall better user experience. Who wouldn’t want that? When it comes to gaming, the Ryzen 1200 GTX 1050 TI SkyTech ArchAngel offers very decent performance. You can achieve the best results at Full-HD resolution and medium to high graphical settings. Most modern games are playable at FHD and ultra settings. They play between 30 and 45 fps, although far faster frame rates are achievable on medium setting. Games such as Assasin’s Creed Unity, Rise of the Tomb Raider and Witcher 3 play at 35, 44 and 40 fps respectively on ultra high and Full-HD settings. Note: While gaming can be a fun pass time, it’s important to engage in it with moderation and self-awareness. Too much gaming may result in physical health and mental challenges. As was mentioned earlier, the fan arrangement and cabling is done pretty well which goes a long way allowing good air circulation within the CPU. When gaming, fan noise is loud enough to be notable but does not get overly distracting. You can solve that with a good set of headsets or external speakers. When comparing gaming ability, the SkyTech ArchAngel GTX 1060 Gaming computer generally offers better performance thanks to its superior graphics card. The [Ryzen & GTX 1050 Ti Edition] SkyTech ArchAngel gaming computer blows all the whistles an entry gamer would be looking for without breaking the bank. In addition, its set of specs make it ideal as leisure gaming PC, media consumption, and heavy productivity. With time, the demands for a more recent and advanced game or more demanding software are likely to catch up with any system. It’s reassuring to know that the processor, GPU, RAM, and storage can all be upgraded. And that all without necessarily upgrading the 500W power supply unit (PSU). Best of all, the SkyTech ArchAngel GTX 1050 Ti is a solid bargain compared to most PCs in the same space. It’s a really good PC that’s worth your consideration.